George Divoky has tracked the life — and decline — of one population of black guillemots in Alaska's Arctic for decades. 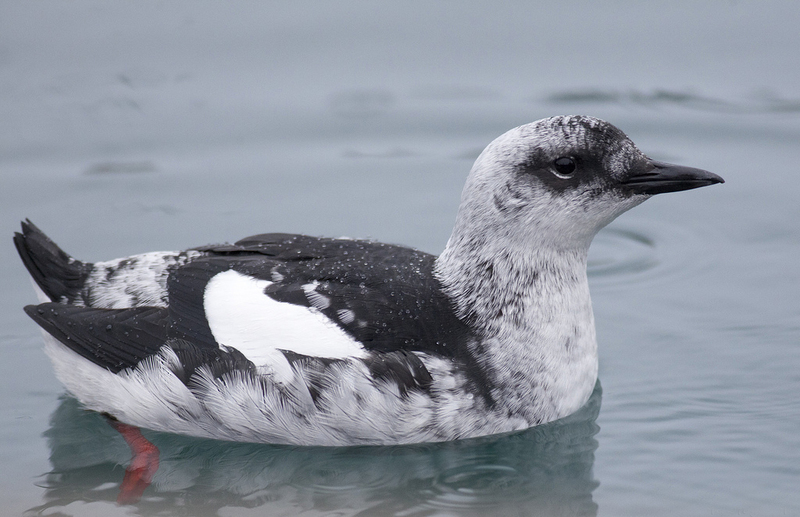 Since 1975, ornithologist George Divoky and his fellow researchers have monitored black guillemots on Cooper Island, off Alaska’s Arctic Coast near Utqiagvik (formerly Barrow). He says this summer proved difficult for both the dwindling population of birds — and for the researchers. “The summer was a rough one for me due to the major drop in the breeding population,” he said after concluding the field season. Divoky, described by Audubon Magazine last year as the “most charismatic megafauna on Cooper Island,” has for decades recorded the biographies of hundreds of birds in meticulous detail, banding every adult and fledgling. His dedication has led to the compilation of a unique scientific record, which all started because he did a bird survey on the island in 1972 and found guillemots nesting in wooden debris left behind long before by the U.S. Navy. He has spent a cumulative total of 11 years on the island, studying the black guillemots, a seabird that lives in waters across the circumpolar North. The birds mate for life and live about 20 years. The Cooper Island colony thrived for many years after Divoky began his annual expeditions there, but in recent decades their numbers have dwindled. The island is getting too warm for the birds, a process accelerated by the increase in the amount of carbon dioxide in the atmosphere. Divoky once monitored the growth of 150-200 chicks a summer, weighing each daily. This summer there were only about 50. They weigh about an ounce at birth and have to be 10 times that size in five weeks to survive. He said he thinks that the survival rate of hatchlings this year was high, but the trend of declining overall numbers is a bad one. Reduced summer ice coverage has made it more difficult for the birds to feed on Arctic cod, their best source of food. The fish linger near the edge of the sea ice and the retreat of the ice means that the adult birds can’t catch cod and get them back to the nest to feed the chicks. This year the ice conditions for the birds remained favorable until mid-August. When the edge of the ice is more than 18 miles away, however, the birds opt to feed their young sculpin, which is harder to digest and not as good for the development of healthy birds. Divoky stays in a small cabin on the three-mile-long sand and gravel spit from the beginning of the breeding season until near the end, when the fledglings either leave their nests or have succumbed to the elements. On Aug. 24, he reported cause for celebration as the oldest nestling on the island had flown off overnight. He said the parents were a bird that fledged from Cooper Island in 1995 and an immigrant — probably from Russia — that he has seen breeding on the island for the past 12 years. “With sufficient luck, in three years the chick that fledged last night will return to Cooper to join the breeding population,” he wrote. Divoky, who earned a doctorate in biology at the University of Alaska Fairbanks, has received international attention for his continuing study of the Cooper Island bird colony. Many see his research as a landmark in documenting the ways in which climate change impacts a specific species. He hopes to keep returning to Cooper Island until 2025, which would mark a half-century of consecutive summers advancing the cause of Arctic science.